The Open Knowledge International report ‘Avoiding data use silos - How governments can simplify the open licensing landscape’ (December 2017) explains why reusable standard licences, or putting the data in the public domain, - are the best options for governments. While the report has a focus on government, many of the recommendations can also apply to public sector bodies as well as publishers of works more broadly. Licence proliferation continues to be a major challenge for open data. When licensors decide to create custom licences instead of using standard open licences, it creates a number of problems. Users of OD may find it difficult and cumbersome to understand all legal arrangements. More importantly though, legal uncertainties and compatibility issues with many different licenses can have chilling effects on the reuse of data. This can create ‘data use silos’, - a situation where users are legally allowed to only combine some data with one another, as most data would be legally impossible to use under the same terms. This counteracts efforts such as the European Digital Single Market strategy, prevents the free flow of (public sector) information and impedes the growth of data economies. To guarantee a licence meets the Open Definition, - the present report strongly recommends to submit the licence for approval under the Open Definition. Central to the Open Definition are nine requirements to legal openness. According to these requirements, open licences must allow anyone to use data for any purpose. Precisely define reusable standard licences in your policy tools. Clearly define a small number of highly compatible legal solutions. The report recommends putting data into the public domain using Creative Commons Zero (CC0), or applying a standard open license like Creative Commons BY (CC-BY) 4.0. There are also several widely known licences address database rights, e.g. the Open Data Commons licences (Open Database Licence 1.0, (ODbL) Open Data Commons Attribution Licence 1.0 (ODC-BY). The CC0, as well as version 4.0 of CC-BY, and Creative Commons Attribution Share-Alike (CC-BY-SA) licences cover database rights as well as regular copyright. Beyond these re-usable standard licences, governments develop their own licences to cover database rights such as the Open Government Licence (OGL 3.0) or the Norwegian Licence for Open Government Data (NLOD). Recently, the Linux Foundation published their ‘Community Data License Agreement’ to address database rights. Highlight the licence version and publish clear notices that concisely inform users about their rights to reuse, combine and distribute information, in case data is exempt from copyright or similar rights. Align licence policies via inter-ministerial committees and collaborations with representative bodies for lower administrative levels. Consider appointing an agency overseeing and reviewing licensing decisions. Attach the licence clearly to the information to which it applies. Maintain stable links to licences so that users can access licence terms at all times. When publishing data, avoid any confusing or contradictory elements such as copyright notices in website footers. Clearly separate a website’s terms and conditions from the terms of open licences. If you still opt to use custom licences, carefully verify if provisions cause incompatibilities with other licences. Add compatibility statements explicitly naming the licences and licence versions compatible with a custom licence, and keep the licence text short, simple, and reader-friendly. 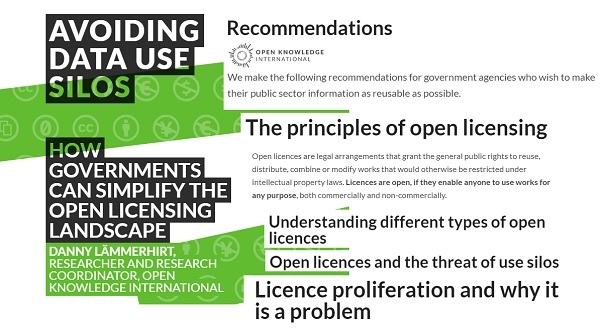 - please, take a look at the Report: Avoiding data use silos – How governments can simplify the open licensing landscape (Open Knowledge International, 2017). OPEN DATA TOOLKIT – providing links to some relevant open resources, checklists, documents, recommendations, and opinions – that could be used in several ways to create, manage and underpin your open data (& research data) effectively. 3 March 2018 : Open Data Day : You are invited ! Get inspired !